DEMO Traction is a NEW conference that will focus obsessively on growth, bringing together the most promising growth startups with prospective customers, investors and strategic partners. DEMO Traction is an invite-only event for startups already exhibiting TRACTION or on the cusp of a major growth spurt because they are solving a big problem with new technology. If your startup has already launched and is ready to gain some TRACTION, this program is for you! Next Up! DEMO Traction Boston, Sept. 16, 2015. For more information, contact Neal Silverman, Sr. VP and GM, DEMO at neal@demo.com. DEMO Traction fee: $11k. Contact Neal Silverman, Senior Vice President, DEMO at 508-766-5463 (office), 781-956-7991 (cell) or neal@demo.com to discuss payment options. 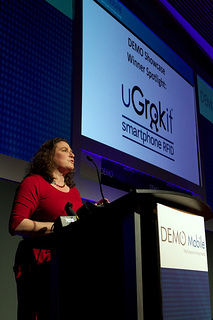 DEMO Mobile 2013 Showcase Spotlight Winner, UGrokit. © 2015 DEMO. All Rights Reserved.